It’s that time of year again. The carolers have stopped singing, the cookies have been devoured, and all of the gifts have been opened and enjoyed or regifted. Now comes the worst part-taking down all of your decorations for storage purposes. However, while most people dread removing their Christmas decorations it doesn’t have to be the daunting task some make it out to be. For instance, a self-storage unit can be used in order to store all of your Christmas decorations until it is socially acceptable to display them again. 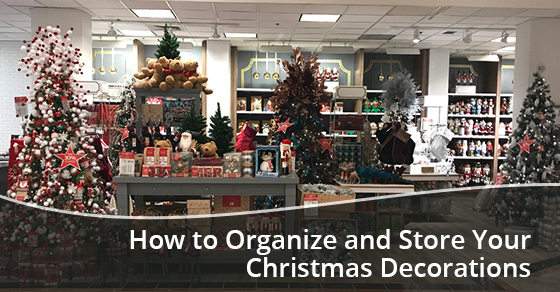 Below are some handy tips that you can use in order to properly organize and store all of your Christmas trees, ornaments, and lights before the next holiday season comes around. Most people simply take all of their decorations, toss them into one big container or box, and move on. However, if you want your decorations to last then you should wrap each item before storing them in a sturdy storage container. By doing so, you will be able to protect each and every item so that you can use them next year. In regards to your ornaments, you can pick up containers that are specially designed to house them. They include dividers so that you can keep them separate from one another so that they don’t bump into each other and break. Moreover, if you opted to go with an artificial Christmas tree this year then we would recommend that you break it into separate sections and then store them in different boxes. Or, to simplify matters, you can simply store the entire unit as one piece into a box that can fit the entire tree. Ideally, the original box will work best, as it will maintain the original shape of the tree. Furthermore, when you are packing your Christmas decorations for storage purposes ensure that you use bubble wrap or tissue paper that is made without any acids. By doing so you will ensure that your precious decorations will not fade, nor will you have to worry about the items rubbing against each other. As an added bonus, you also won’t have to worry about the items being exposed to any damaging moisture while they are stored for the winter. The best way to organize your decorations it to colour code them: This is especially recommended if you enjoy changing your festive theme every year by using different colours. By colour coding your decorations you won’t have to take out all of your decorations the next time Christmas rolls around. That is, you will only need to take out the decorations that match the colour of your current Christmas theme, taking some of the guesswork out of decorating. As an added tip, it helps to label your storage boxes or containers, so that you will know exactly what is stored in each of them. By doing so, the next time you need to find a specific type of decoration you won’t have to go through all of your boxes in order to find it. If you decide to move all of your decorations into a storage unit then you will likely require a unit that is 5×10 or 5×5. That is, you will likely need a self-storage unit that is about the size of a walk-in closet. As such, most Canadians will have sufficient space to house their wreaths, trees, boxes, and storage bins until the next Christmas arrives. Moreover, if you want your Christmas decorations to remain in optimal shape then you will need to store them in a self-storage facility that provides climate control functionality. Once winter passes, spring and summer will soon follow, and you want to ensure that your expensive decorations are protected from shattering, melting, and discoloration brought on by excess humidity and heat. With a climate-controlled self-storage space, your decorations will be protected from any damages that are caused by the weather. Canada is unique, as it is the only country that has 4 truly unique seasons, but this also means that you have to be prepared for climatic fluctuations as well. As such, if you decide to rent a climate-controlled self-storage unit then you can rest assured that your Christmas decorations will be protected from external factors. Finally, it is very important that you avoid stacking containers or boxes too high. The general rule of thumb is to never stack containers more than chest height; as this will ensure that the containers won’t fall off or crumble under the weight of the other containers. If you need a state of the art self-storage unit to properly organize and store all of your Christmas decorations then we can help. We provide a plethora of different self-storage solutions and facilities for our residential and commercial customers. Furthermore, just some of the features that our cutting-edge self-storage facilities provide include climate-controlled environments, computer controlled access, monitored fire alarms, high-security levels, flood damage control, and extra high ceilings. We also provide self-storage units in multiple sizes to accommodate the needs of our clientele, and we are the proud recipient of the Consumer Choice Award: An award that we have won 20 times thus far. In fact, Toronto Life Magazine named us Toronto’s best storage company You’ve tried the rest, now it’s time to try the best! For more information please do not hesitate to visit our website or give us a call at 416-74-JIFFY. We are strongly committed to going above and beyond the call of duty to provide our clients with superlative service at a consumer-friendly price.